In Thailand, food is a celebration. For a Thai, cooking is a source of pride. Thai food is a combination of delicious aroma, brilliant colours and exotic spices. Thai cooking is simple, quick and healthy. It is particularly appealing because of its healthy, low fat method of cooking. Thai cuisine is a confluence of Chinese, Malaya and Indian influence, which the Thai have skilfully adapted as distinctly their own. Try a traditional satay with peanut sauce, followed by red Thai curry and crispy vegetables with a tangy dipping sauce. Accompany these with Masaman Curried Rice or with Glass Noodles in sesame paste. Finish the meal with a wonderful dessert- Crispy Fried Ice-Cream ball. All the ingredients used in the recipes are easily available although their substitutes have been given in case of non-availability. Discover the secrets of Thai cooking with this beautiful illustrated book. 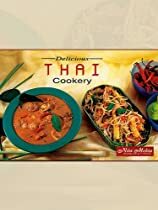 Follow the step by step instruction to make classic Thai meals in your own home. In a span of a few years, over 3.5 million Nita Mehta cookbooks have been sold. The secret of her success is her thorough & meticulous approach towards her books. She also has several cooking institutes under the name of “Nita Mehta Culinary Academy” in New Delhi (India), where she has trained several thousand aspiring individuals into expert cooks. In addition, she creates recipes for food-related companies around the world. Nita Mehta, the celebrity cookbook author, has another ace up her sleeve. She has published unique children books under her company – Nita Mehta Publications. Nita Mehta Publication is specialized publishing house producing exquisite children books. Learning is never easy for children. But now you can make learning fun by using these simply written and beautifully illustrated children books by Nita Mehta Publications. These books not only entertain children but also inculcate wisdom and good values in them to help them face day to day challenges of life. “The books are written in a simple language with lots of illustrations to make understanding easier and make the experience enjoyable,” says Anurag Mehta CEO of Nita Mehta Publication. Till now, Nita Mehta Publications, has published over 60 titles in Children books, ranging from Mythological ones like Tell me about Hindu Gods and Goddesses, Tales of Shiva, Tales of Vishnu, Tell me about Hinduism, Classic Tales of India, to Historical ones like Glorious History of India, Festivals of India and even adventure tales.